Special thanks to Matt Forrest Esenwine, children’s writer and voiceover talent, for letting us share this interview, first posted on his blog Radio, Rhythm & Rhyme. Rebecca is faculty, along with Georgia Heard, of our upcoming Craft and Heart of Writing Poetry workshop, and we thought you’d like to get to know her. Matt: I have been a fan of Rebecca Kai Dotlich’s work ever since I began striving in earnest toward my goal of becoming a published children’s writer. Rebecca has a way of writing that simultaneously paints a familiar picture while touching the reader in a new way. Here we chat about writing, inspiration, collaboration–and a similar start to our careers! Rebecca grew up in the Midwest exploring trails, reading comic books, making paper dolls, and building snow forts. She was a good student in school…but by her own account, not a perfect one. Although she loved reading and writing, numbers (ie, math!) was a bit of a challenge. She attended Indiana University where she studied creative writing, art history and anthropology while working in the student library. After college she held many jobs: working in a department store, for a real estate firm, a state representative, and in public relations. After her children were born she decided that writing for children would be her life’s work – although that took many years to achieve, as you’ll see from the interview. 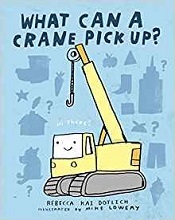 Rebecca is the author of titles such as What Can A Crane Pick Up? (Knopf Books for Young Readers, 2014), which received a *starred* review from Publishers Weekly; What is Science? (Henry Holt and Co., 2006), an AAAS Subaru SB&F prize finalist; Bella and Bean (Atheneum Books for Young Readers, 2009), an SCBWI Golden Kite Honor; and Grumbles From The Forest; Fairy Tale Voices with a Twist (WordSong, 2013), co-authored with Jane Yolen. She speaks at conferences, retreats, libraries, and schools across the country to teachers, aspiring writers, poets, and students of all ages. Her books have received the Gold Oppenheim Toy Portfolio Award as well as a Bank Street College of Education Best Book of the year, and her work has been featured on television programs like Reading Rainbow and Between the Lions. She lives in the Midwest with her husband and her four young grandchildren live nearby. Matt: First of all, thanks so much for taking the time, Rebecca! There is so much to talk about, but I would be remiss if I neglected to share a little “mutual experience” of sorts that you and I share…and that is that we both can say our very first books were published by the good folks at Boyd’s Mills Press! Yours was Sweet Dreams of the Wild, a bedtime book of poems published in 1995…and since then, you’ve had approximately 30 books you’ve authored, co-authored, or have in the pipeline, and you’ve had poems selected to be in about 100 anthologies. So congratulations on all your successes! Rebecca: I heard the good news Matt, and send you an abundance of congratulations! Each and every book is exciting in its own way every single time, yet that first book, that first sale, will always be something so very special. Matt: Who – or what – inspires you? And how do you know when a piece of writing is complete? Rebecca: I’ve always been inspired by words noodled together like a puzzle; words that send my head into the clouds or my heart thumping or my dreams dreaming. Since I can remember, lyrical language and metaphor have been somewhat like a hobby for me. When I came across words or phrases or metaphors I loved, I collected them by writing them down in notebooks. Sometimes I’d paste photos to go with them. My grandparents and my parents inspired me in every way. My big brother had a sea of books on his shelves, on his bed, in front of his nose. He’d read me excerpts when I didn’t even understand what I was hearing. He’d throw words into conversation to stump me, and when I didn’t know what the word was, he’d tell me to look it up. So I did. Probably he nudged me to feel the wonder of books and what they held inside. And I was initially inspired to write poetry for children when my own children were small and I was going through a hard time in my life, and pouring over poems about puddles and umbrellas, giants and mermaids, skies and stars and snowmen seemed to soothe my soul. 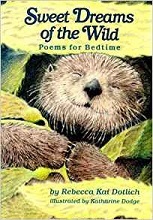 Two books that initially inspired me to write poetry for children were Poems and Rhymes, a book from the Childcraft library, and Side by Side compiled by Lee Bennett Hopkins. And by the way, LBH has always inspired me to dig deeper just when I think I can’t. Matt: So at what point do you decide a poem is finally done? Rebecca: Can you ever really know when the writing is complete? I don’t believe so. That’s the magic of creativity. It’s a feeling of finally letting go, of sensing you’ve wrapped up a moment or an idea or a package of words as tight and as telling as you can. For the moment. It’s like saying how do you know when you’re done staring at the sky. You don’t. You just feel it’s time to get up. To move on. Time stopped for that small bit of time, and held some form of magic or fascination or angst or play or joy in your soul, and hopefully will again. Matt: Do you share your poems or manuscript texts with anyone before submitting? Rebecca: For the most part I don’t; I am a pretty solitary writer and submitter. When I began years (and years) ago, I knew no one to share with and of course it was way before computers and internet, so I just happily read, studied and wrote. But having said that, there are times now that I do share poems and manuscripts back and forth with just a few poet and author friends who I respect and trust. I am also lucky enough to have an agent, and a few really special editors who are in my corner. Matt: How did your career progress from writing poems and picture books to writing things like books for HarperCollins’ I Can Read and Growing Tree series, which – while creative – are more educational in nature? How does a poet make that leap? Now the I Can Read (Peanut & Pearl) is a different story. I had always wanted to write an I Can Read book. I fell in love, years ago, with Frog and Toad. Who didn’t? I read them to my children when they were young. So I had studied the structure, word count, page breaks, etc., on and off for a long time. They seem simple, but they really aren’t. I’d like to write more. Matt: Are there any genres of writing that intrigue you, but that you have yet to tackle? Rebecca: Yes. I am working on a novel in verse and have ideas for a chapter book series. But poetry is (as my granddaughter would say) my favorite and my best. Matt: Do you have a process for figuring out what you’re going to write and how you’re going to write it? That is, if a subject is a poem or a picture book, and how you’ll construct it? Rebecca: I wish I did have a process. I can’t say that I do. Things just kind of happen. A seed of an idea, a lyrical line, a phrase, and I let it spill onto the page and see where it takes me. Then when I get the bones of it down, I take a look and see if I want or need to mold it differently. Matt: Over the years, what part of writing has gotten easier for you, and what has gotten more difficult? Rebecca: Nothing has gotten easier. Finding time has gotten more difficult. Matt: You collaborated with Jane Yolen to write Grumbles From the Forest, a collection of poems about the secret thoughts of fairy tale characters. How do you come up with fresh ideas for collections such as this, and what is it like to write a book with someone who is half a country away from you? Rebecca: To be honest, I didn’t come up with the idea, Jane did. Sounded great to me; I’m always on board with anything that involves fairy tales. I loved them as a young girl, and still do. We both thought putting a twist on them by way of poems would bring new readers to the tales. Working together was easy because of the internet. Much easier than it would have been by letter writing before email. We had ideas and first drafts and revisions flying back and forth constantly. Matt: Speaking of collaborations, tell us about your book, One Day, The End: Short, Very Short, Shorter-Than-Ever Stories (Boyd’s Mills Press, 2015). This must have required a great deal of collaborating with illustrator Fred Koehler, yes? Rebecca: No collaborating at all! I didn’t know Fred. I wrote the (short) and spare picture book knowing an illustrator would add layers to it, and possibly even take over the book in his or her own way, which I expected and delighted in. Matt: That’s fascinating to me, because it looks like the type of book that would have necessitated the author conspire with the illustrator. Rebecca: Artists, and what they bring to the table, fascinate me. It’s magical to see your words brought to life in a new, different, clever and colorful way. My editor, Rebecca Davis, brought Fred Koehler on board and gave him full rein to add his own view of the stories. He had a different vision that I had, but that is usually a very good thing! Matt: Sometimes I’ll get an idea for a poem or book, but can’t flesh it out for weeks or months or even longer. Are there any subjects or ideas you’d like to tackle in a poem or book, but just haven’t yet? Rebecca: Absolutely. I have drawers and files with parts and pieces and beginnings. Some take months and some take years and some never do get fleshed out. I have a few ideas on the back burner but since they are just ideas, I probably will let them simmer awhile. Matt: In some ways, it’s become harder for a new writer to break into children’s literature and get published; technology has allowed more and more people to share their work via blogs and self-publishing, so making a mark for oneself can be difficult with so much competition. Conversely, though, technology has also allowed more people to learn the craft and be able to connect with editors and agents – so in some ways, it’s easier. What are your thoughts on the changes in the industry, as you’ve witnessed them over the past 20 or so years? Rebecca: The opportunity to publish is definitely easier. My younger self can’t imagine *connecting* with, or *chatting* with an editor all the way in New York City. Goodness, one lived in Indiana or Montana or Texas and sent a manuscript with an SASE and hoped for a postcard months and months later. There was no connecting until the connection. Hard to imagine now. Matt: Can you share your favorite self-penned poem here? her perfumed skin . . .
when mama came to tuck me in. Matt: I love those “waltzing wind-chimes” and the “tinkling tin!” Well, thank you so much, Rebecca, for taking the time to chat…it’s very much appreciated, and I wish you much success with all your new books!